It's been an interesting 2015 so far for Andy Murray. There was that Australian Open final. There was that return to the "Big 4." There was that stretch of tournaments without a sniff of a semifinal. There were those convincing defeats at the hands of Novak Djokovic. But I guess you'd have to say the good outweighs the bad, for the most part, especially coming off a season where he was rebounding from back surgery--not really the easiest thing in the world for a professional athlete to deal with. Anyway, the reason I bring up Andy Murray is because of Rafael Nadal and his upset loss to countryman Fernando Verdasco. Not that Nadal's exactly been a Miami world-beater, but in my mind, his loss makes a Murray run to the finals as close to a sure thing as it gets. I'd say the toughest player left in the bottom half of the draw is Tomas Berdych, and Murray's come through against him with regularity. 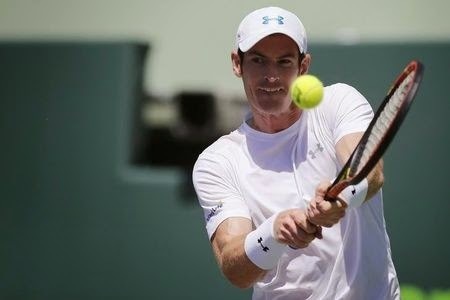 I'm not necessarily tapping Murray for the finals once he gets there--I don't know what can derail the Novak Djokovic express--but a title-round tilt can be another notch in what has been an interesting campaign so far.